It's been a very long time since I've read this particular book by L.M. Montgomery but I was very glad to revisit it. I had to have been 12 or 13 when I first read it and I immediately followed that reading up with a viewing of Lantern Hill (the movie) . I loved the movie but my recollections of it are slightly different than the story I just read. Wish I could compare the two for you but my memory is not that great. If you are unfamiliar with the story, it revolves around young Jane Victoria Stuart who lives with her mother, Robin, and an authoritative grandmother in Toronto. She spends the first twelve years of her life depressed and anxious, living under the thumb of an oppressive grandmother who can't bear the idea that her own daughter (Robin) had run away with a man that she had not approved of. It isn't until Jane is twelve that she is informed by a schoolmate that her father is still alive. Prior to this revelation, Jane had believed her father to be dead. However, it turns out that he is alive and kicking and living on Prince Edward Island. Shortly upon the discovery of his existence, her father sends a request that Jane spend a summer with him on PEI and she grudgingly goes to meet him. As it turns out, she absolutely adores her father and spends the rest of the book wishing that her parents would realize their abiding love for one another and that her little family would be reunited once more. In typical Montgomery fashion, I need not fear a spoiler, of course the book ends on a "happily ever after" note (because that's the way Montgomery readers liked it and still do, btw!). "At sunset Jane and dad went down to the outside shore . . . as they were to do almost every night of that enchanted summer. All along the silvery curving sand ran a silvery curving wave. A dim, white-sailed vessel drifted past the bar of the shadowy dunes. The revolving light across the channel was winking at them. A great headland of gold and purple ran out behind it. At sunset that cape because a place of mystery to Jane. What lay behind it? "Magic seas in fairylands forlorn?" Jane couldn't remember where she had heard or read that phrase but it suddenly came alive for her." Some apparently protest that Montgomery was overly fond of adjectives. And now I wink at you. And I think in exclamation points too, by the way! I think Montgomery couldn't help herself. She was overwhelmed by beauty and anyone who is able to be made breathless by the sheer beauty of anything can tell you that there are not enough adjectives in this world to adequately describe their emotions. That's all Montgomery is doing and I cannot fault her for it. What I can fault her for is dedicating this book to her favorite cat, Lucky. Of course, I'm not a cat lover (I'll take kittens for a moment though) and I think it's rather lonely to only have a cat to dedicate something to. Was there no one else to love and honor in a book dedication? To me that's just sad. God's thoughts are not our thoughts and His plans are also not ours. Sometimes what we think is meant for our utter destruction, is actually for our good. "God," said Jane distinctly and deliberately, "is no good." After discovering that her dad is an amazing man and The Island a thing of dreams, she finds her perspective has changed a bit. "I think," Jane said decidedly, "that I should apologize to God." I can think of a few things I should apologize for and either have or need to be in a position to do so. The times when we are most apt to think that things are not working in our favor are sometimes the very best, most pivotal moments of our lives in which God is working behind the scenes to enrich us in ways we cannot presently imagine. He is so good to us that way and that is yet another reason we should choose gratitude when we'd rather just grumble a bit. Jane is one of many great characters penned by Montgomery. I find her to be quite different from Anne in that she lacks in self respect, humor and general happiness whereas Anne seems to just carry those three things with her wherever she goes. Jane is a good friend to make and I'm glad that I got to spend some time with her during the L.M. Montgomery Challenge. Amy at Hope is in the Word read this book as part of last year's challenge. 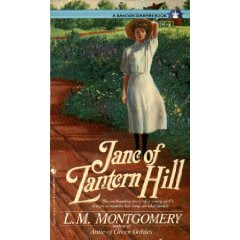 You can read her thoughts on Jane of Lantern Hill by CLICKING HERE. Not sure what I plan to pick up next but I'm sure to enjoy it, I know! Last year was my first time to read "Jane," and I enjoyed it! I don't think I have read this, but it sounds delightful. I'm on p. 48 of Anne (Happy sigh!) I love Montgomery's finely drawn characters and descriptions. It's colored a little bit this time by having learned that her life was so unhappy, but perhaps writing is where she found her joy. I have seen the movie. I'll have to read the book now. Great post. I seen the film it was very good a much loved film to see. I've only read the Anne of Green Gables books. I hadn't even heard of this one, but it sounds good. Thanks for bringing it to my attention. I've read a lot of Montgomery's books but somehow missed this one. That will have to change. Thanks for the review. I would love to read this book. It sounds like a great story.